For our patients who don't want braces, Invisalign is just the thing to help them achieve that brilliant smile and the beautifully straight teeth they long for. Read on for more Invisalign info. 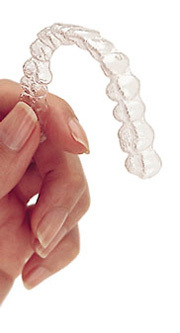 Invisalign is a system where a series of trays, called aligners, are worn by our patients. Gently, and over time, these trays help to align the teeth. But some great advantages about the aligners are that they're made of clear plastic, so they can't be seen and that the patient can remove them. This makes eating, brushing, flossing and other dental hygiene so much easier. Not only that, our patient can eat the foods that they like and won't need to avoid those that might stick or get caught in traditional braces. Moreover, they are smooth and comfortable to wear and won't irritate the mouth the way that the brackets and wires of metal braces can. First, our patient has a consultation with our orthodontist. The orthodontist will take X-rays and use them to make a digital, 3-D image of the patient's teeth. Because of this image, the aligners can be custom made to fit the patient's teeth perfectly. Our orthodontist will also use the 3-D image to show the patient how his or her teeth will come into alignment over time. Usually, an adult patient needs to use the Invisalign system for about a year, while teenage patients use it for about as long as they'd wear traditional braces. The aligners should be worn for 20 to 22 hours a day, and as the patient's teeth straighten, they are replaced every two weeks or so. This means that a patient will have between 18 and 30 aligners over the course of the treatment. The patient visits with the orthodontist every month and a half to make sure that everything is going as planned. When the treatment is over and the patient finally has the smile he or she always wanted, the orthodontist may then have the patient wear a retainer for a while to make the smile permanent. Patients who are interested in Invisalign shouldn't hesitate to get in touch with our orthodontist, Dr. Matt Beecroft who is an Invisalign Premier Provider at Beecroft Orthodontics. We have three convenient offices in Virginia: our Fredericksburg Leavells office can be reached at (540) 898-2200, our Stafford office can be reached at (540) 659-6300 and our King George office can be reached at (540) 775-2022.